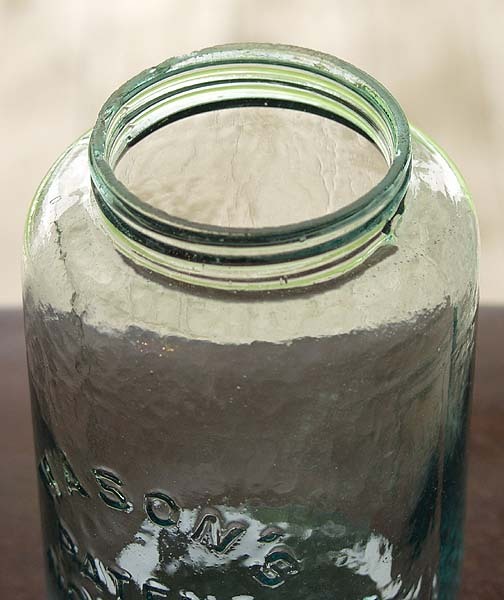 For your reference, this page contains some jars previously sold on our direct sales page. An extremely rare color and the finest example with sharp embossing and in sparkling condition with no damage or stains. The correct original button insert is an exact color match. 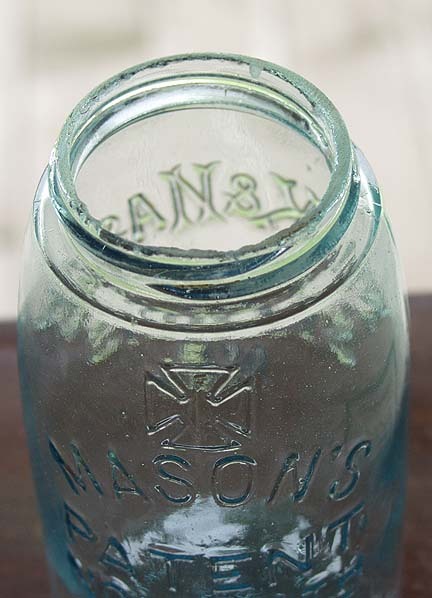 An aqua midget pint "BBGMCO" monogrammed jar, which is strongly embossed and in sparkling condition with no damage or stains. 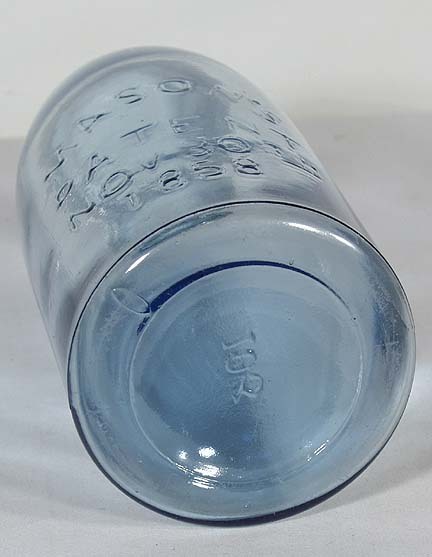 Comes with the very scarce correct original Ball Bros milk glass insert that is perfect, and the correct Ball style zinc band that is also perfect. 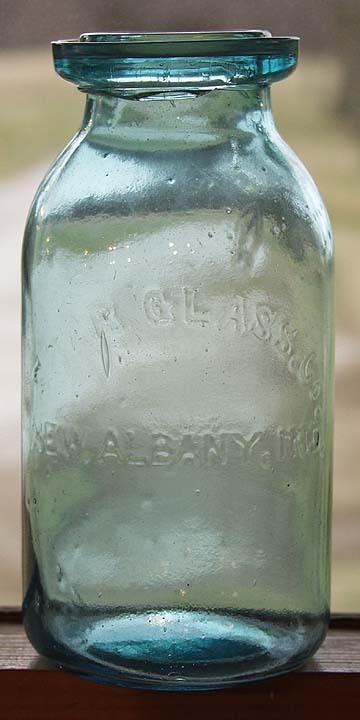 An early style 1858 half gallon in a rare light cornflower blue color. Sparkling condition with no damage or stains. Has some nice character with milky swirls running thru the glass. To view the base click here. To view the mouth click here. 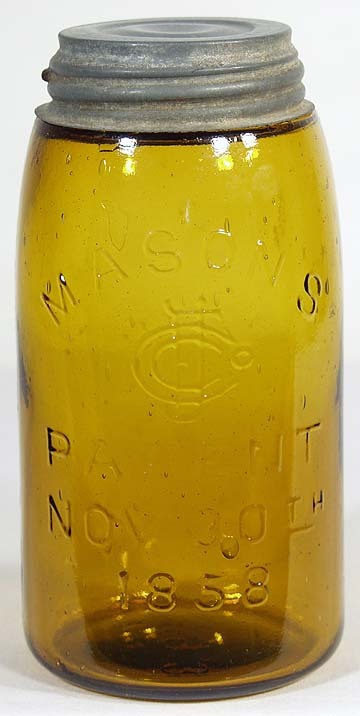 This Masons over Cross quart has good color, nearly medium olive green. Fine condition with no damage or stains. Fairly good embossing on the jar also. The color is much better than the more common light yellow greens of this series. 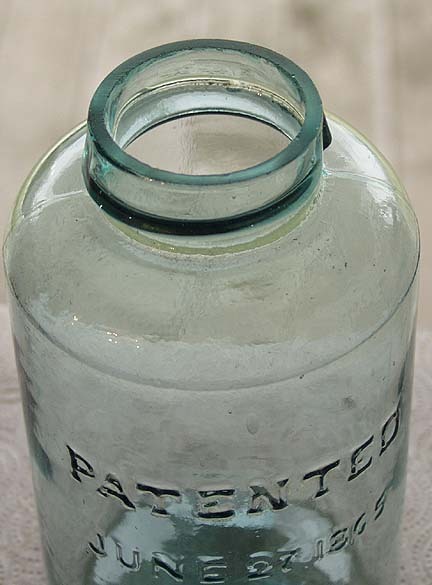 A lovely old jar. 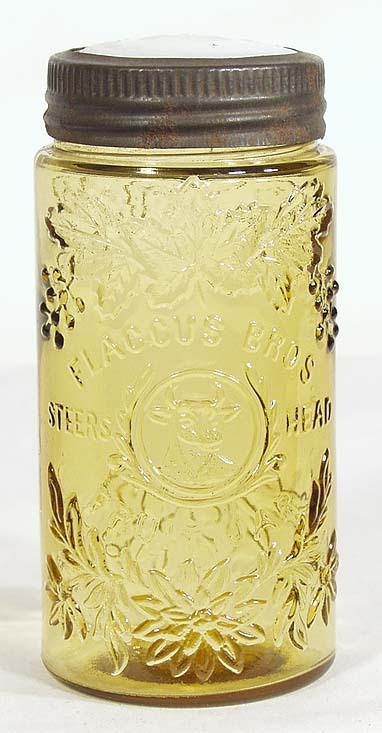 A bright, strong citron colored quart with bold embossing and matching citron colored glass lid. No damage or stains and brilliant glass. The base has an unusual large mold number 36. A beautiful colored Lightning jar. 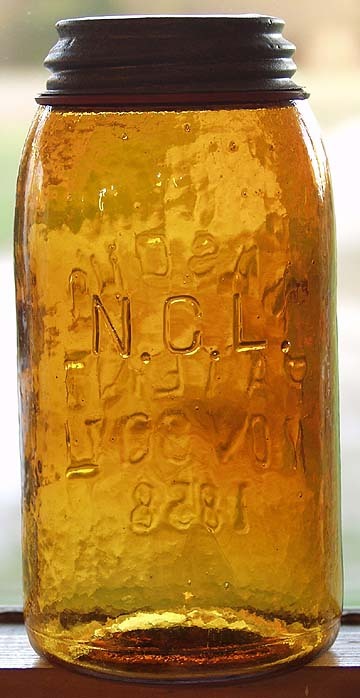 A very boldly embossed quart in a good dark "root beer amber" color. The embossing is extra bold and the glass is shiny with no damage or stains. The ground rim has the normal minor flaking. To view the rim click here. 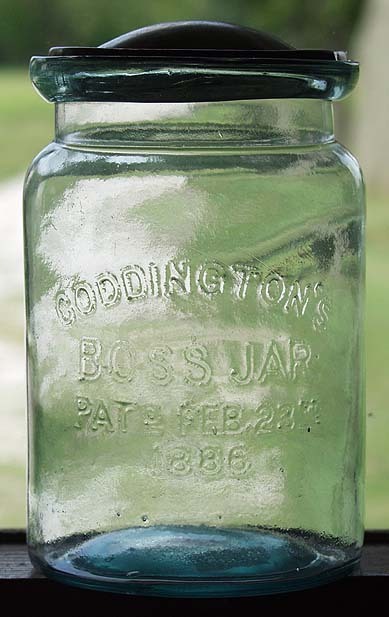 An aqua colored, squatty quart wax sealer, embossed �CODDINGTONS BOSS JAR PAT'D FEB 23RD 1886". Excellent condition with one tiny flick on the inside of the top rim. 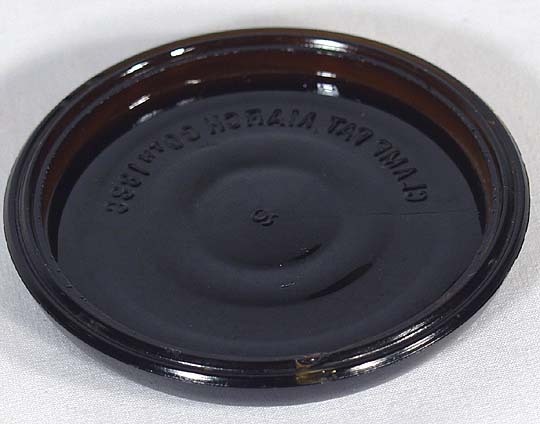 The mouth finish was intended for a tin lid, sealed with wax. The metal cap is a reproduction. 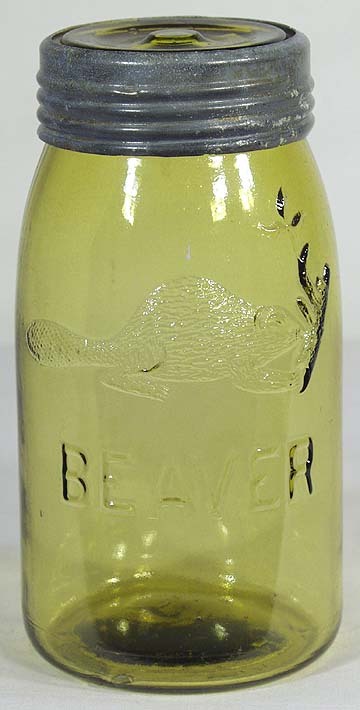 Only 2 examples of this rare jar have been reported. 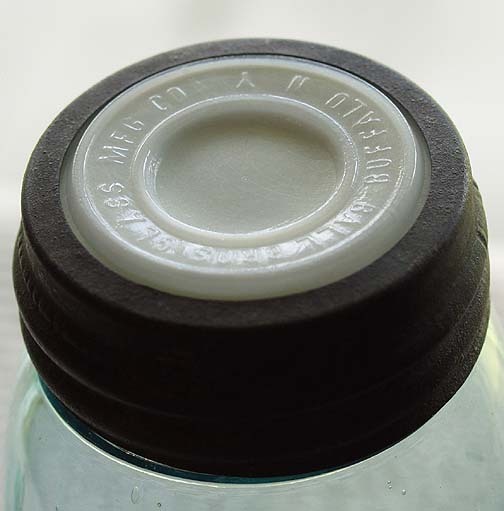 The mold was not deeply cut so the embossing is lightly raised. 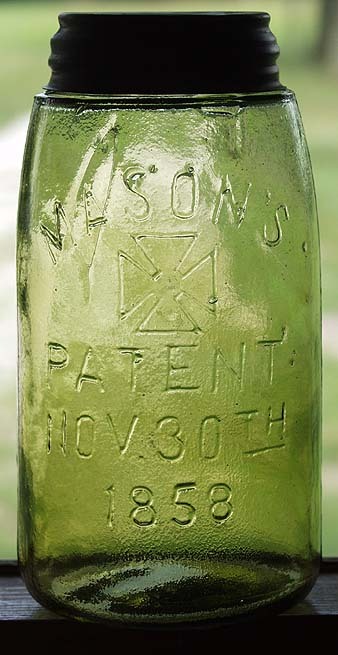 A very interesting and obscure early jar. This quart comes in a strong yellow color with slight olive tones. A beautiful colored jar in fine condition. The ground rim has some minor chipping. 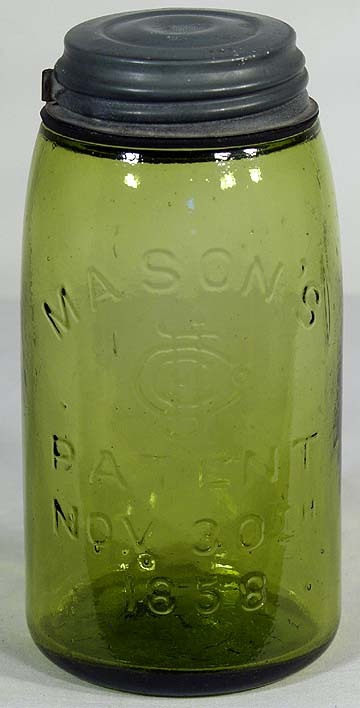 A bold Lime Green colored pint Lightning jar. The glass is strongly whittled and shiny clean. 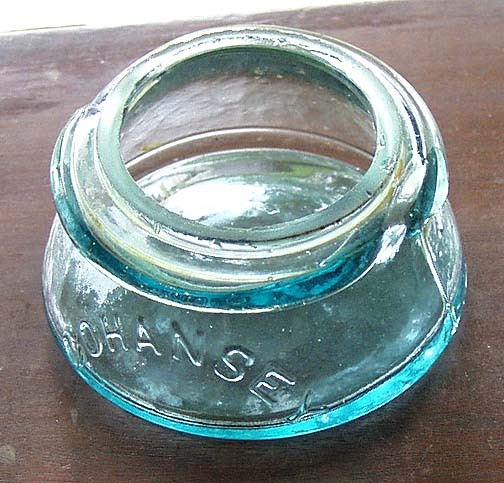 The glass lid is an exact color match and the metal closure is original. Inside the shoulder is a raised bubble that entrapped some residue at the edges. The ground rim has some minor flaking. In the back edge of the ground rim, there is also a very faint flash within the raised rim itself. A beautiful color that is very hard to find in the pint size. A rare, very dark, almost black amber colored quart. The glass character is fantastic, with heavy whittling and absolutely chock full of tiny seed bubbles. The embossing is very sharp and strong. 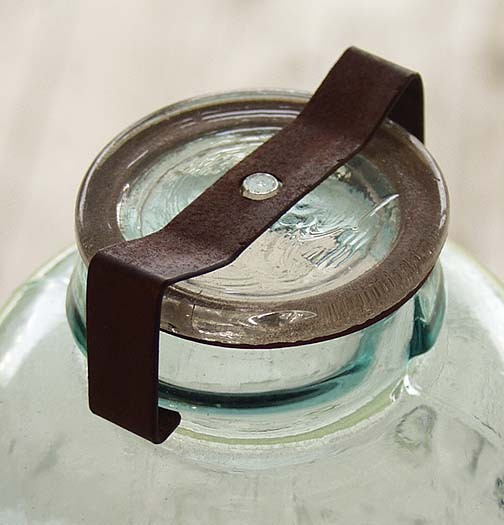 The correct glass lid is a perfect matching color, and the 3-piece clamp assembly is all original. No damage or stains at all. 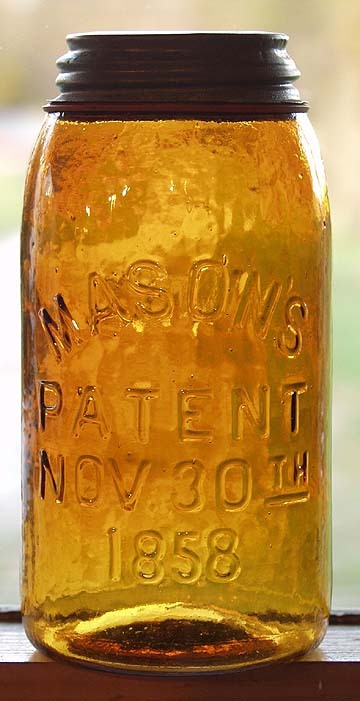 A fantastic old jar. To view the lid click here. To view the clamp click here. An outrageous deep olive-amber colored FCGCo wax sealer in mint condition. Perfect lip, shiny glass and no damage at all. Crude glass with an interesting folded spot on the heel. A fantastic colored jar. 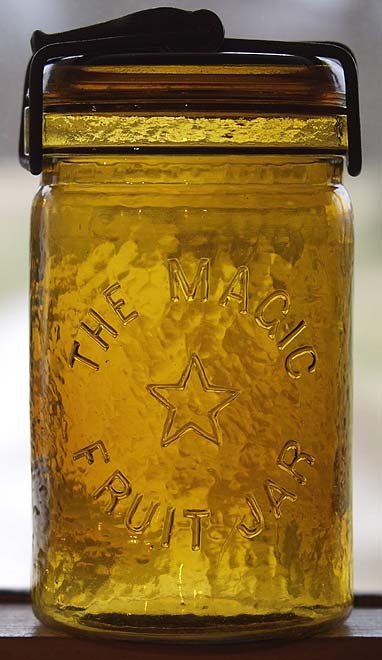 A rare PINT sized yellow amber MAGIC STAR jar, with sharply whittled glass, sharp embossing, and excellent condition including a perfect ground rim. 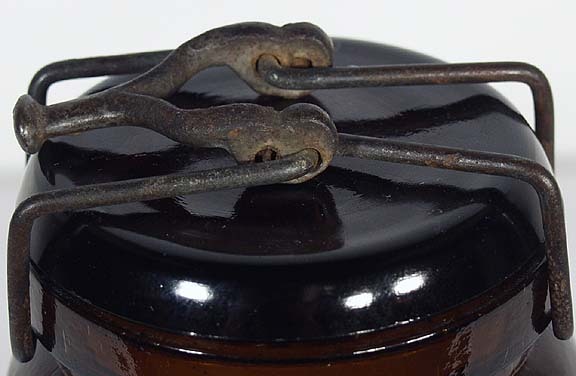 Original all-iron clamp and matching color original lid (lid has small nicks on the bottom). This is undoubtedly the finest possible example of this highly appealing little jar. To view the closure click here. To view the bottom side of the lid click here. 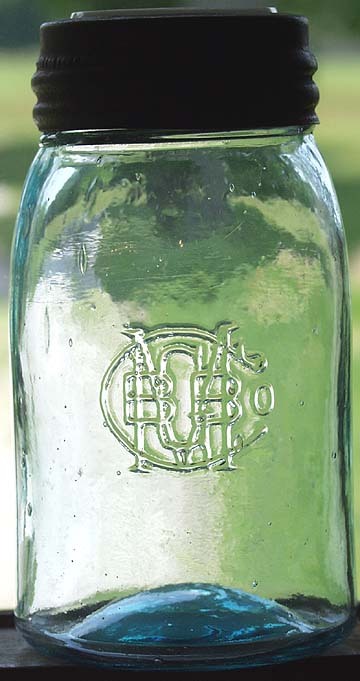 An aqua half gallon made by the Hemingray Glass Co and embossed in two lines PATENTED JUNE 27 1865. 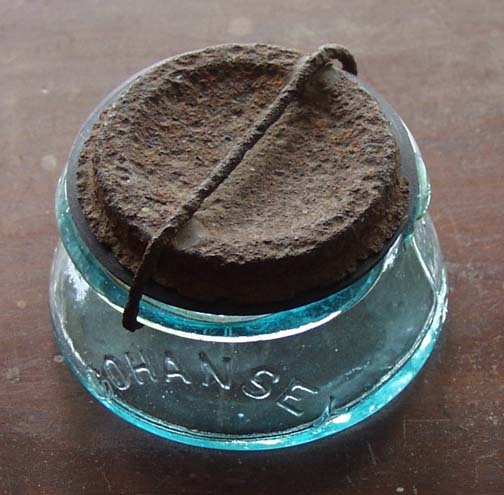 Original glass lid with raised center button to accept the the iron clamp, which is an old-looking replica. There is one flake on the edge of the glass lid. 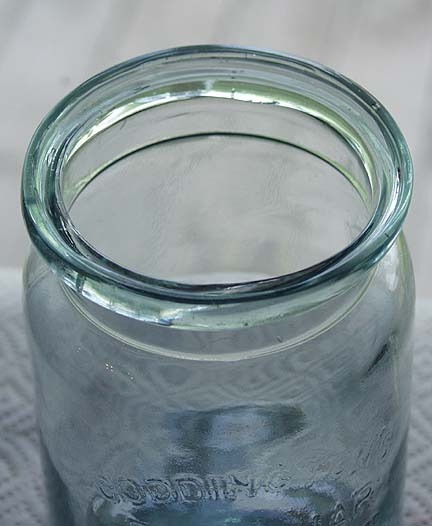 The jar is in beautiful condition, with a good thick ground rim that has no flaking. Strong embossing and shiny clean glass. 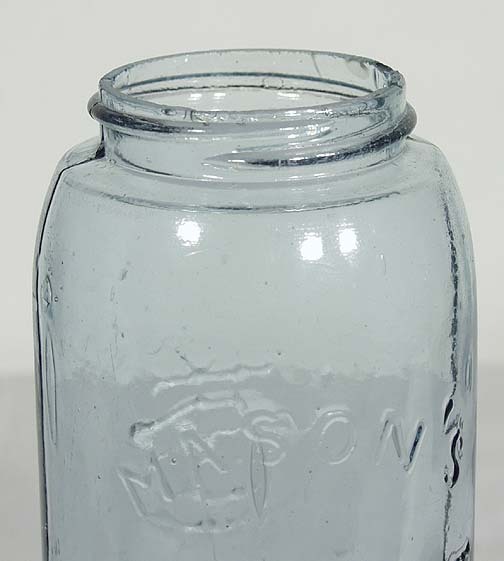 We�ve seen only 2 of these jars in half gallon size, they are quite rare. 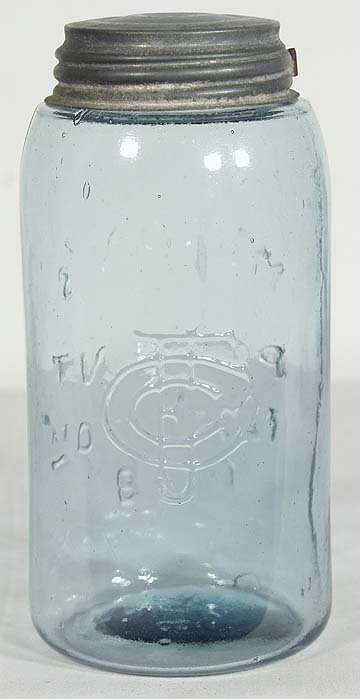 A rare light cornflower blue colored tall quart 1858 jar with large CFJCO monogram on the reverse. Strong embossing and sparkling glass. The ground rim has normal light flaking, and does have one hard-to-see �flash� in the threads. The base has a backwards-embossed mold number. Good lugged CFJCo lid. See the color comparison photo which highlights the true light blue color. To view the reverse side click here. A very scarce color true yellow (no amber) quart Globe in fine condition. Note the contrast between the light orange amber lid, and the lighter color of the jar. Excellent condition with bubbly glass and no damage. Ex: Al Vignon collection. A scarce PINT, in fine condition. 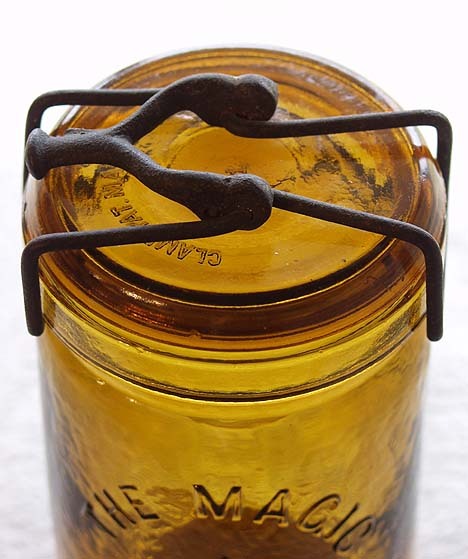 Original iron yoke clamp and original glass lid. The jar is flawless including the applied mouth, with not so much as a nick. Very tough to find and rarely seen in this size. 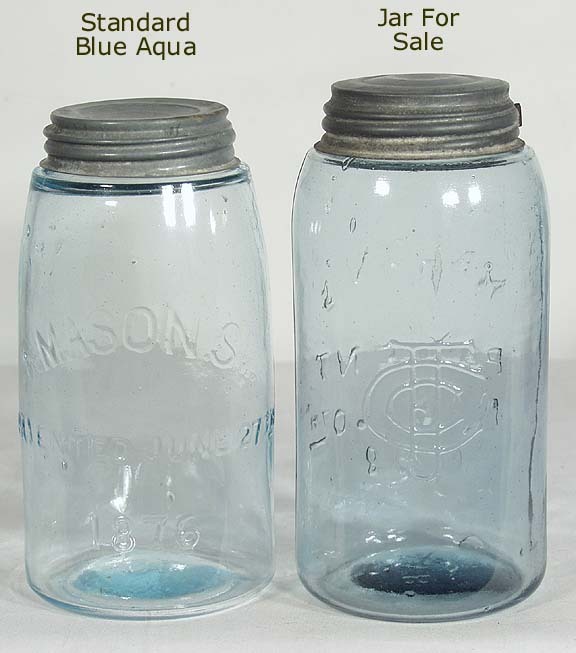 A very unusual strong blue colored quart STAR GLASS CO NEW ALBANY IND wax sealer. The jar is shiny clean and free of damage. Check the color compared to aqua in the photos below. The embossing is weak but uniform and readable. To view a color comparison to aqua click here. 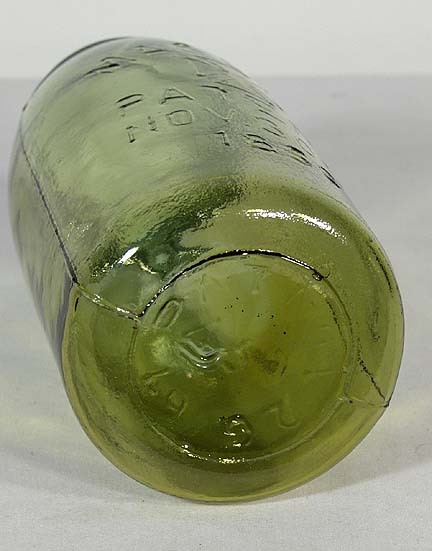 A lovely bright yellow green colored quart with nice bubbly glass character. 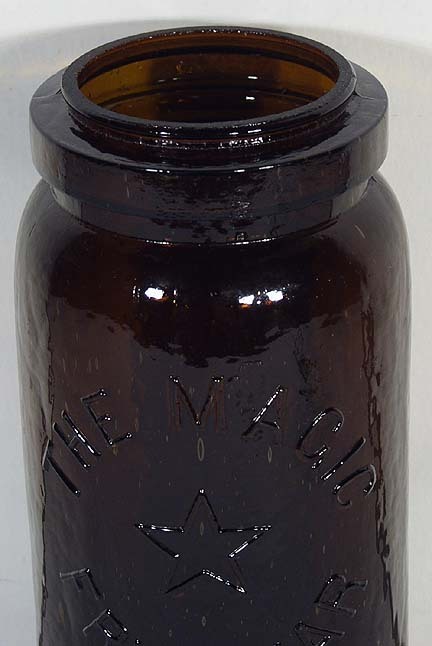 This is the early small lettering style jar. The lid is an exact color match, and the metal closure is original. A great colored Lightning. 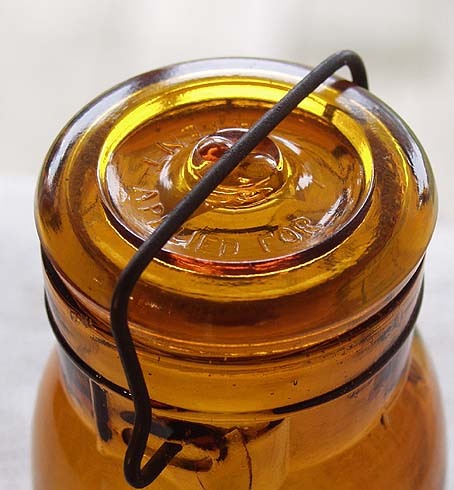 An extremely whittled honey amber colored quart LIGHTNING. They don�t come any more whittled than this! Sparkling glass with sharp embossing and original matching lid and original metal bail closure. there are a couple pinpoint nicks on the neck collar, very minor. 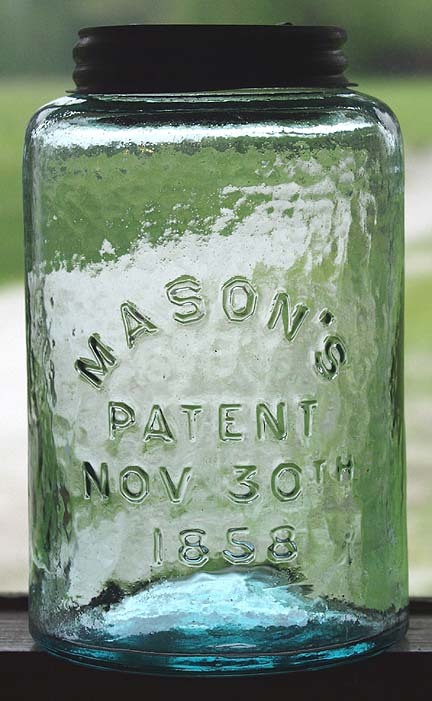 A fantastically colored half gallon 1858 jar. 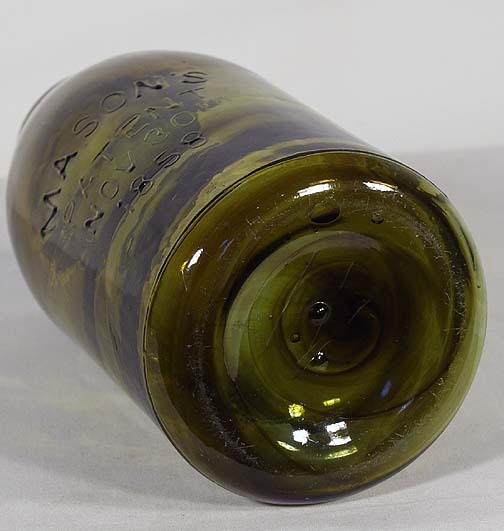 The jar is dark green with large amber swirls throughout. 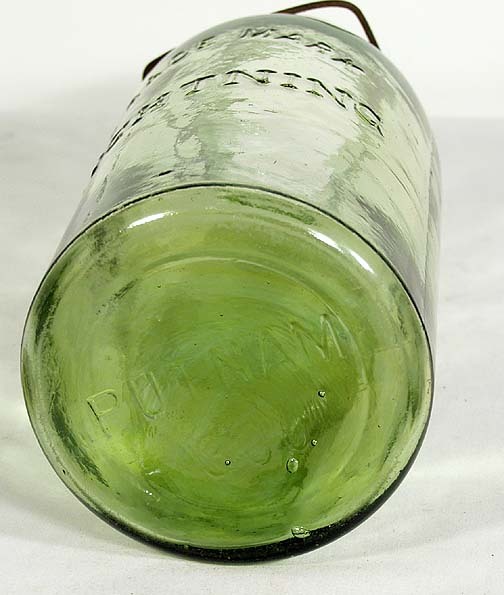 Sparkling mint condition, with scarcely a mark on the jar anywhere. Smooth lip finish, and has a single raised dot on the base. 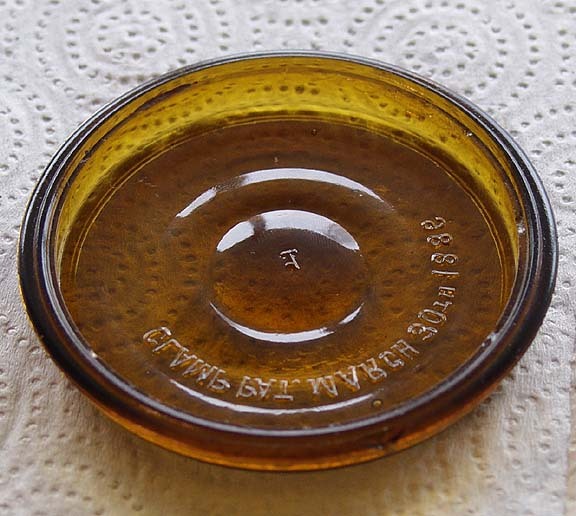 A deep reddish amber quart in sparkling mint condition. Has a nice thick ground rim with very little flaking. 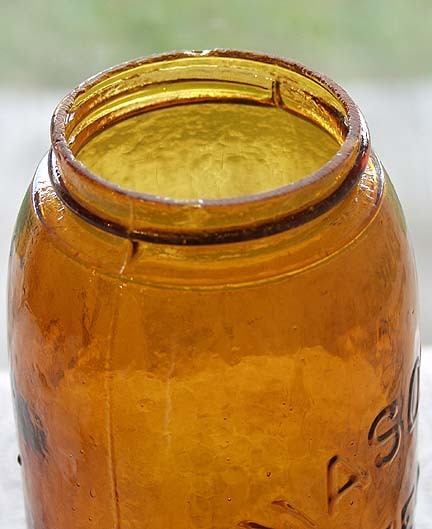 A beautiful old jar. 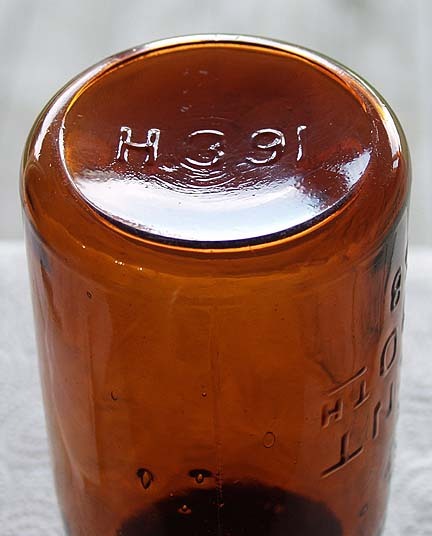 A beautifully colored quart 1858 jar with a hammered whittled appearance to the glass, and extremely bold and sharp embossing. I believe this mold was done by EHE (Edward H Everett) as it is identical in appearance to an EHE marked example we have. 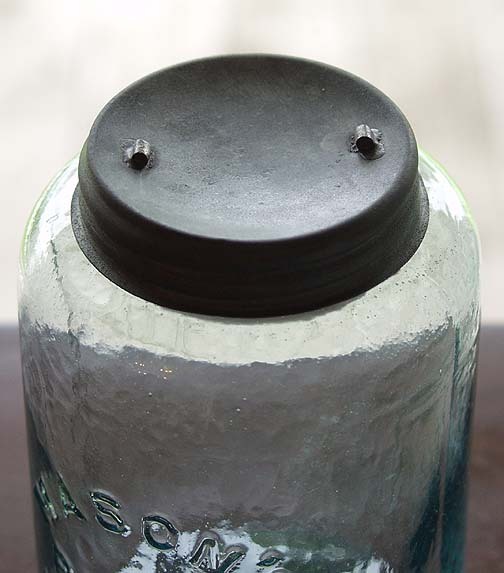 The other earmark of his jars are a symbol-busy base, which this jar has also (including a mold number, a diamond figure and a very highly raised dot). Sparkling mint condition. 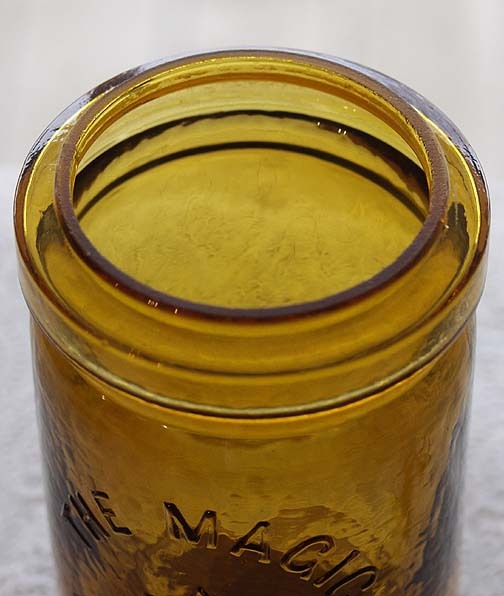 A quart LIGHTNING jar in a nice olive yellow color. Good embossing and brilliant glass with a light whittled effect. Matching colored lid and original metal hardware. The base has PUTNAM 17. A great colored Lightning jar. 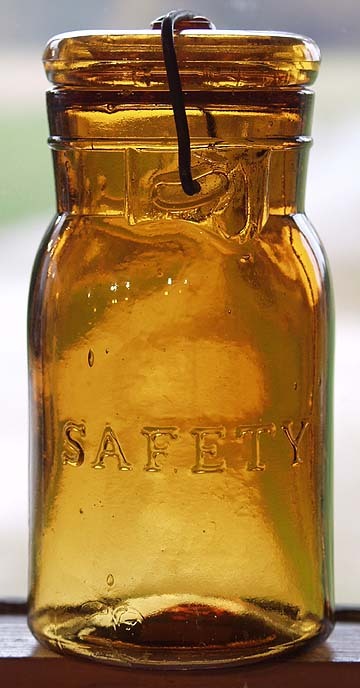 This pint SAFETY is a sharp and sparkling example and retains the original iron wire clamp and correct matching honey amber glass lid. Strong embossing and no damage or stains. Has one small, skin-deep open bubble inside the bottom, very minor. 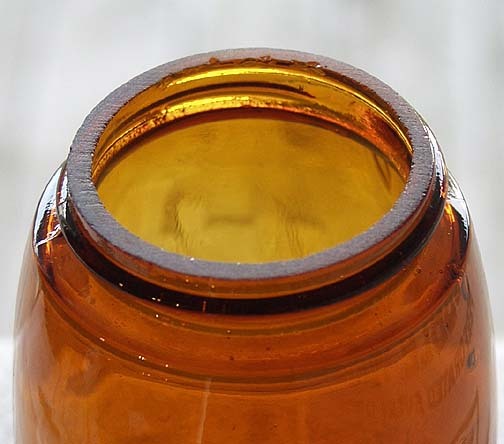 A bright honey amber colored quart with a nice whittled effect to the glass and good strong embossing on both the front and back. Shiny clean with no damage or stains. The ground rim has one tiny chip and the usual minor flaking from the grinding. 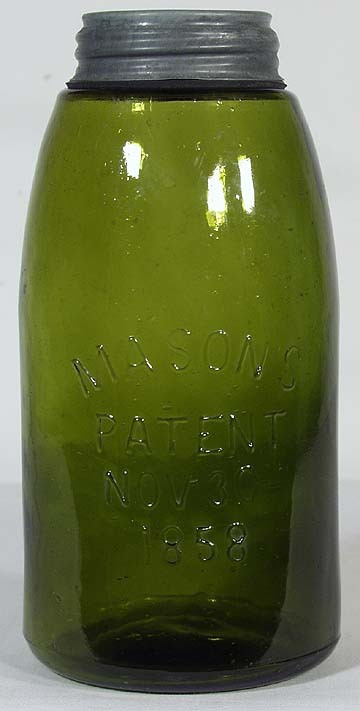 A fine example of this rare old 1858 jar. 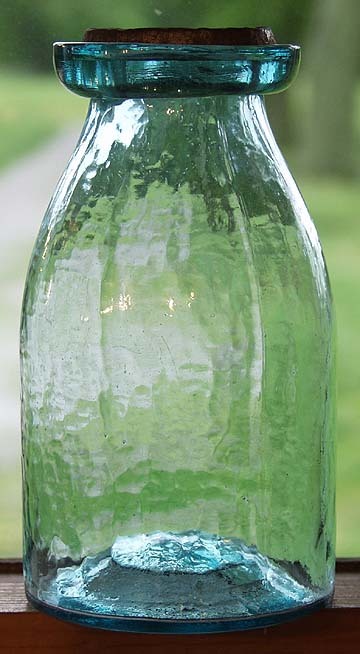 A beautiful example with sparkling glass that has a good overall whittled effect. Very bold and strong embossing. 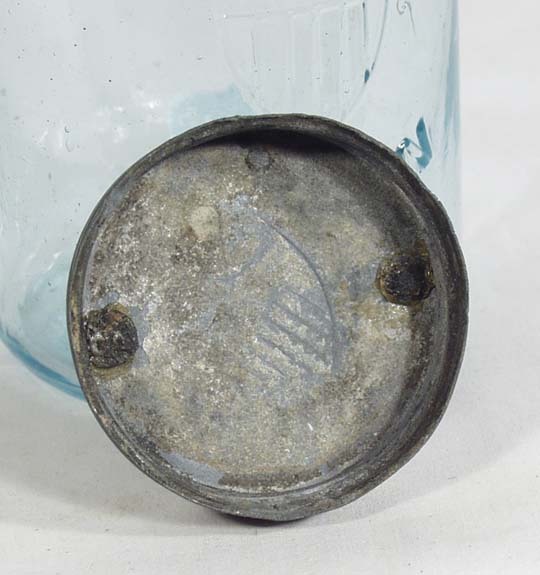 Excellent original unlined zinc cap with soldered lugs on top and partly visible is the 1857 patent date circle. 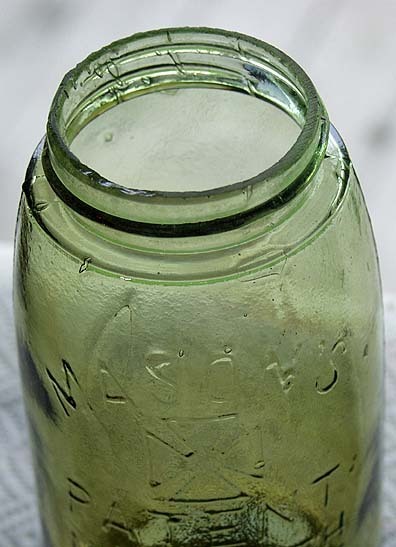 The jar has no damage or stains of any kind, the best possible example. To View the cap Click Here. A VERY strongly embossed example in a good deep reddish amber color. 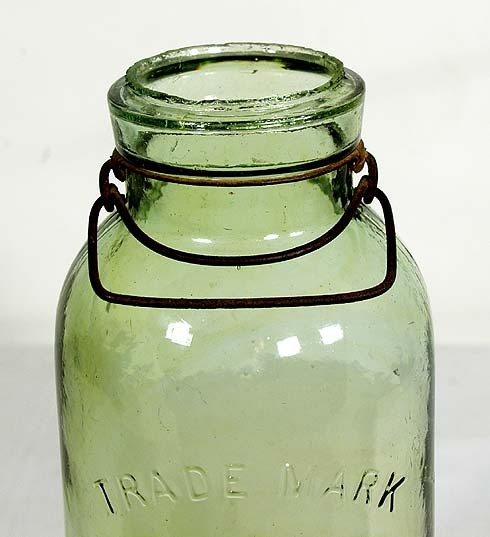 An early style with large & bold lettering that is also similar to some early beehive jars, and is situated low on the front of the jar. Beautiful condition throughout with a whittled effect to the glass. 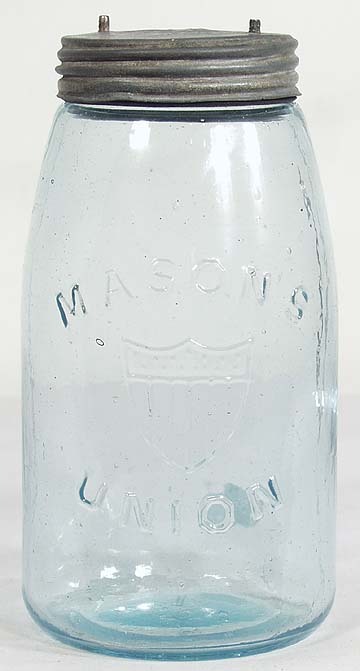 A strongly whittled aqua quart with sharp embossing and original glass lid. Also retains its original iron clamp, which is very rare to find. The clamp is rusty as shown, but solid (the tiny center tab is missing). 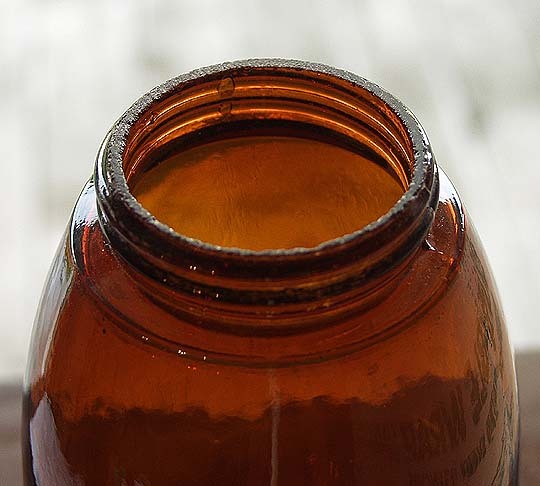 The glass lid is rough on the bottom side. 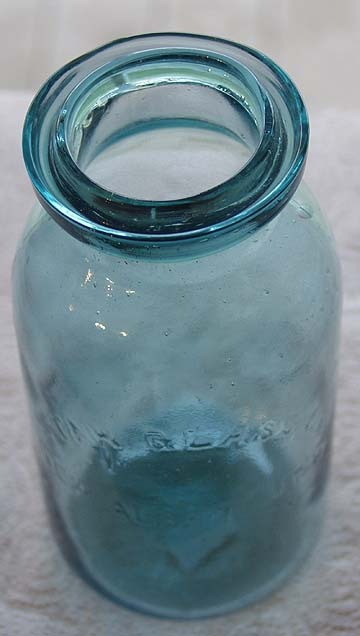 The jar is shiny clean with no damage or stains. An outstanding example. A good Lime Green colored half gallon. Excellent condition with no damage or stains. Strong embossing too. A scarce color to find in a half gallon Lightning. 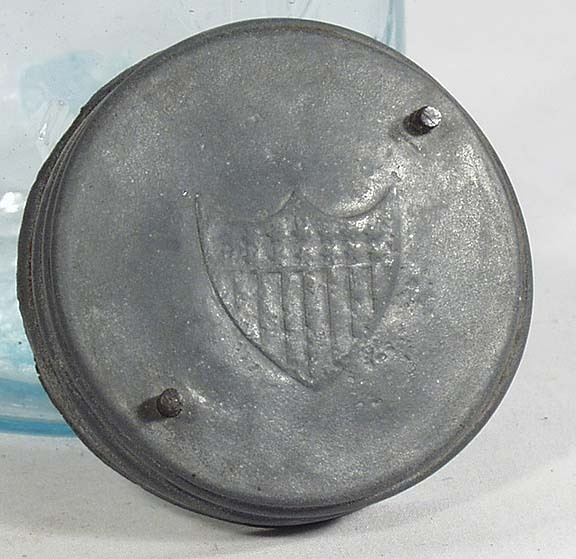 An extremely rare example, having an original unlined zinc Union Shield lid with vertical prongs. 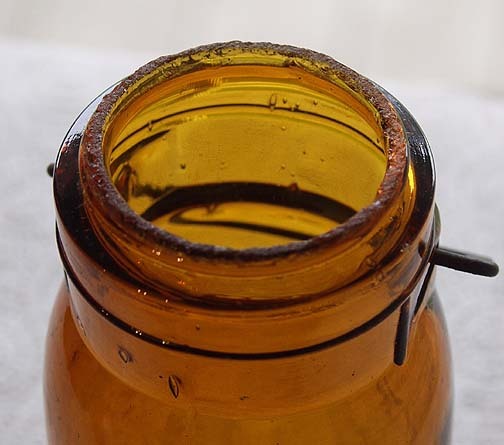 The lid is in good shape with no holes or significant corrosion. However, one prong has been replaced. The embossed shield is very clear with stars and stripes. 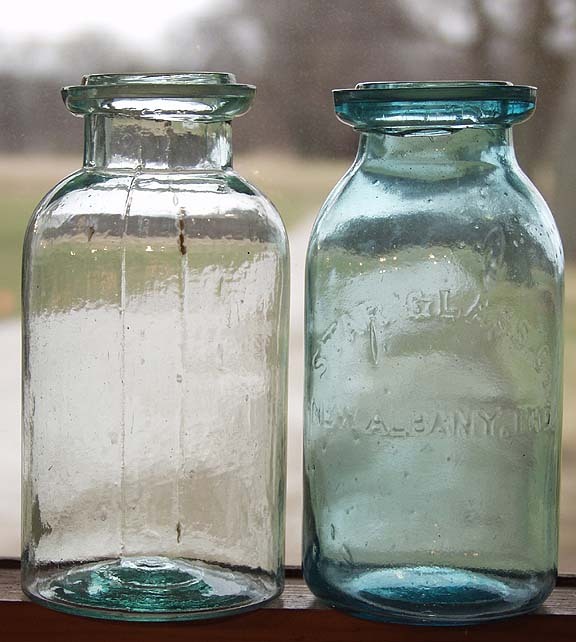 The jar itself is cracked, but the jars of course are fairly common. Here you are buying the rare part, the lid. 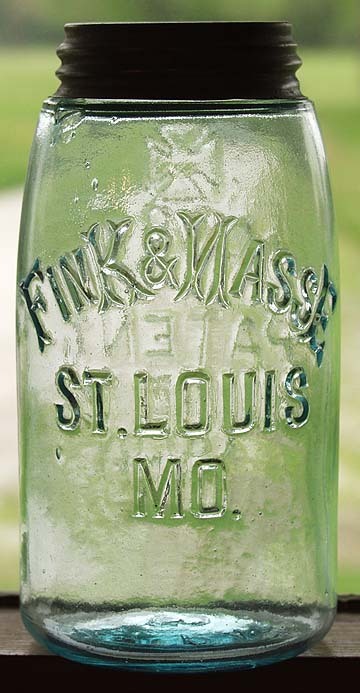 Masons 1858 Rev FINK & NASSE St Louis. 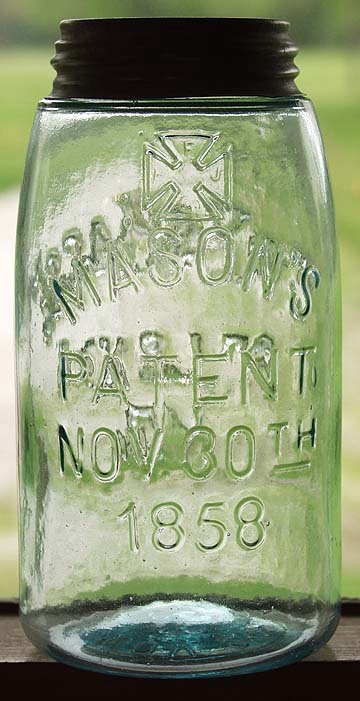 A rare reverse-embossed Masons 1858 jar. Very bold and sharp embossing that is heavily raised off the jar. Sparkling condition with no damage or stains of any kind. Redbook #1944. To view the reverse Click Here. 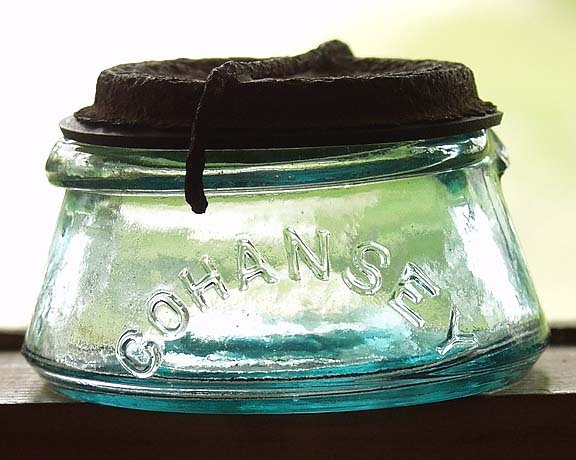 Among the rarest of all the Cohansey jars, these were most likely made only for use in demonstrating the closure. Shiny glass with no stains or damage, except for a chip off the end of one of the neck ramps. Good ground rim. 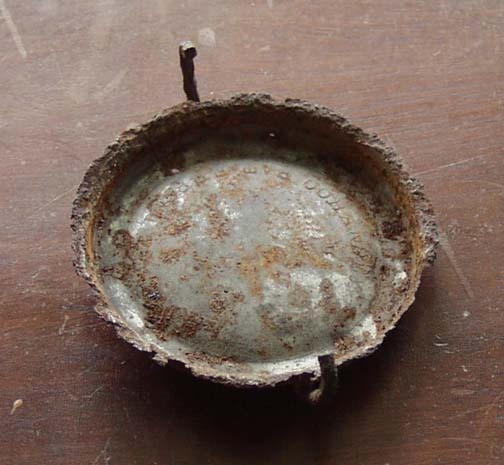 The metal lid is heavily rusted, but there is still lettering visible on the inside. 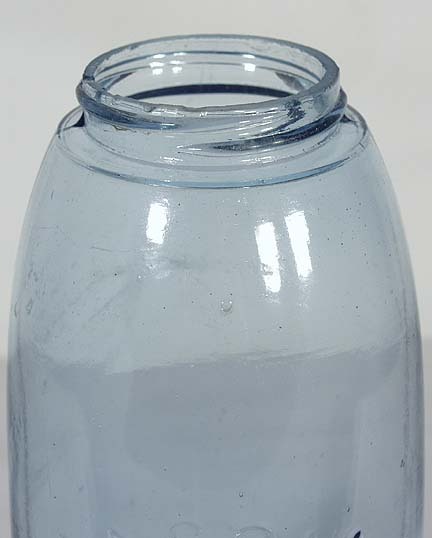 All varieties of the glass Cohansey lids also fit this jar perfectly. To view the inside of the lid Click Here. Copyright � 2007 - The contents of this web page, supporting code, and all images contained herein are copyrighted by Greg Spurgeon Antiques. None of the content of this page may be reproduced, published, transmitted, or linked to in any way without prior written consent.